Discovering Urbanism: Growing in or growing out? For a while now some researchers like Christopher Leinberger have been pointing to a resurgence in urban redevelopment, while others like Joel Kotkin have been telling the opposite story of perpetual exurban expansion. Leinberger wrote last year that "conventional suburban lifestyles fall out of fashion and walkable urban alternatives proliferate," and Kotkin, writing in the middle of the summer surge in gas prices, retorted, "Not so fast. The "out of the suburbs, back to the city" narrative rests more on anecdote than demographic or economic fact." Demographic research is not wine-tasting. Numbers are numbers. So who's right? A new study of census data for residential building permits lands on a good answer to this: it depends on whether you're looking at absolute numbers or trends over time. Yes, it appears that more people are still moving into outer suburbs than central cities, just as they have been for the last several decades, but the share of building permits allocated to central cities has grown steadily over the last decade in most metropolitan areas - quite substantially in a few. The study was conducted for the EPA by John V. Thomas. Because of the data it uses, the picture is necessarily drawn with a broad brush. 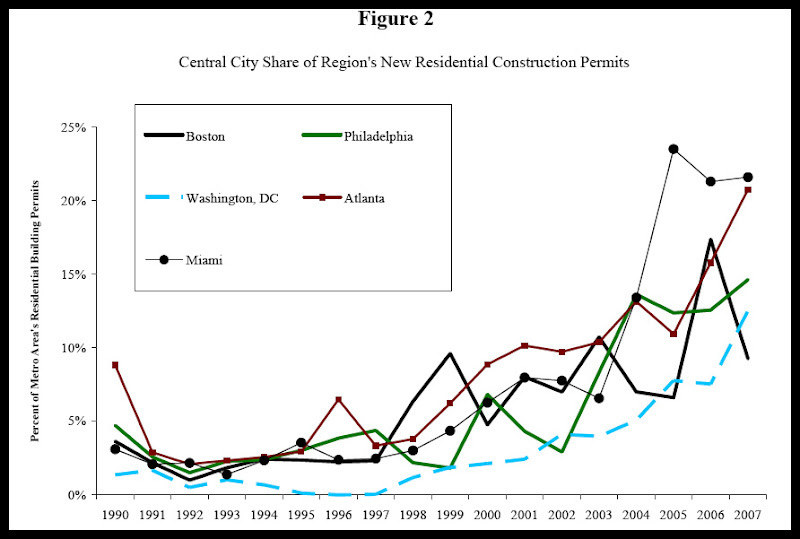 The census tracks these permits by jurisdiction, and cities like Houston with perpetually growing borders are tough to compare with East Coast metropolitan areas that ground annexation to a halt in the early 20th century. Still, even if spatial comparisons are not entirely accurate, the story of changes across time is a relevant one. "Even with solid economic fundamentals, many large-scale redevelopment projects still require changes in local regulations or public infrastructure investments to be successful. For example, transit-oriented development often requires updates to zoning codes, more flexible parking regulations, assistance with land assembly, or improvements to upgrade water, sewer and local streets. Brownfield properties often need assistance to evaluate contamination and potentially clean up soil and groundwater." This is a helpful reminder that the picture of what is happening does not entirely reflect market demand. It is a fallacy to conclude that the majority of people want to live in the suburbs simply because the data indicates that a majority of houses are built there. There are a host of decisions made by the public sphere that have just as significant an influence on development patterns.